The proper functioning of all your plumbing systems is essential to the comfort, enjoyment and safety of your home. Problems with your plumbing system need to be resolved quickly and professionally. Christian Plumbing & Tile, Inc. has the Knowledge, Experience and Commitment to Customer Satisfaction you need when you experience any kind of plumbing problem at your home. We take care of any plumbing fixture and plumbing or tile repair - everything from your smallest problem to your largest project - from replacing a cracked tile to tiling your entire home, from repairing a leaky faucet or toilet to re-piping your home or remodeling your Bathroon or kitchen. All at competitive prices. We also have available a full line of replacement products if you want to upgrade to avoid future problems. Ask us about water and energy saving fixtures. Christian Plumbing & Tile, Inc. strives to ensure each and every job runs smoothly and efficiently! Guaranteed to leave your home as clean as when we entered. We know that emergencies happen in this business and we are ready to help. Serving the needs of customers in the Volusia County area for more than 30 years, we look forward to being of service to you! 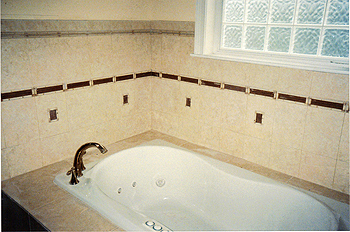 Christian Plumbing & Tile, Inc. can remodel old bathrooms with new designer vanities,bath tubs, showers, toilets and tile to give your bathroom a whole new look. We can remodel all the old plumbing in your kitchen with new pipes, sinks, faucets, garbage disposals, dishwashers, tile to give your home a new kitchen. 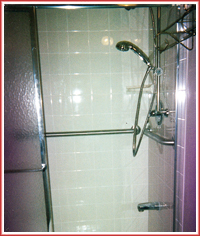 We are also handicap bathroom specialists. By doing both plumbing and tile, we can save you money. One-on-one consultation with our experienced staff and careful planning can help you stay within your budget. Go Here for a more complete list of services. Contact us for more information or to schedule service.